There's no easy, one-size-fits all set of rules for living a healthy life. That's why, at Pomme, we strive to provide you with as many options—and as much support—as possible to help you make the best choices for your own life, while sticking to some fundamental ethical and nutritional values when deciding what makes it onto our shelves. We consider our super knowledgeable staff one of our greatest resources. Never hesitate to ask for information or advice while you shop! We research every company we work with. Not to sound negative, but we start off with some simple no's: no artificial colours, flavours or sweeteners are allowed in our markets! Beyond that we look at a number of factors, like a focus on local and Canadian vendors, the uniqueness of products, the quality of ingredients, and the ethics of the companies—as well as listening to our customers' recommendations—to make sure you're getting the best of the best. When it comes to produce, we're in tune with the seasons so we can work with our amazing local and BC growers whenever possible. We carry only organic or local spray-free. When it comes to international produce we make every effort to support Fair Trade. For a more in-depth look at our produce department, check out our Growers page and read up on a some of our local farms and ethical international suppliers! Our Healthy Living department is packed full of products to help keep your body functioning at its best inside and out, from specialized vitamins and supplements to luxurious moisturizers. Again, we have some no's here: no parabens, sulphates or additives. We really focus on Canadian makers—especially those in BC—and our Healthy Living Specialists are always happy to help you figure out the right choices for you! We have a delicious natural deli at our Poco location with options for a number of dietary paths! We use the same top-quality organic produce and all-natural grocery we have in our aisles to make fresh soups and sandwiches daily, as well as a variety of salads and other tasty treats. We also bring in ready-to-eat natural meals and snacks made by some of the most talented bakers and cooks in the lower mainland. 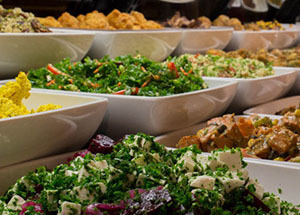 At Poco, we also offer customised catering—contact us for more details! Some very kind words from our awesome customers! "Love Love Love this store!! Your go to for organic and gluten free foods. Best place to buy supplements and very knowledgeable staff. If they don't stock something you want they will probably get it in for you. They always have sales and a member points club too!!" - Krista M.
"All I can say is wow!!!! They have everything I could need and great prices. There is a good selection of bulk items and pre-packaged bulk items so you don't have to buy large quantities of things you want to try. I also loved the non-food section that had items from personal care to household cleaning. And to top it off, the staff were very friendly and helpful! This is my new go-to store for all my needs." - Tanya E.
"It's a great place to get organic fresh produce. With all the sprays and GMO's now it's hard to get quality produce. Pomme has a great selection as well as many other organic, natural needs. The customer service is great as well. Staff is eager to help." - Shauna C.
"I love Pomme. They really have everything I want. Many vegan food products and cruelty free skin and hair care. You can pick up supplements, loose leaf tea's, produce and bulk grains all in one spot. Their staff is always attentive and kind to boot. Definitely my favorite spot to get groceries in town." - Sarah S.